A View From Wapping To Canary Wharf’ is a patchwork abstract oil painting of an elevated Wapping view looking east to Rotherhithe and then onto the skyscrapers of Canary Wharf. 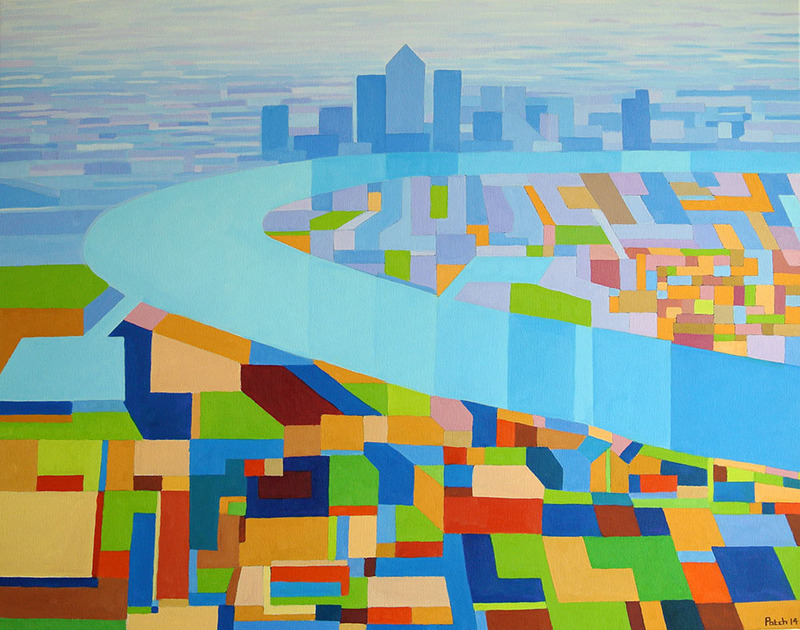 The painting shows a panoramic view of Wapping’s green residential area, the meandering Thames, and the Isle of Dogs business district including One Canada Square at Canary Wharf with its distinctive pyramid-shaped roof. Painted from my balcony which has a spectacular view of the Thames and the Isle of Dogs, exclusive prints of this painting are now displayed in 140 rooms in the new Tune Hotel in Canary Wharf. The original painting is now for sale exclusively on Artfinder.